View Students enables users to glance at a list of students and their associated contacts. 2) Click Menu from the top right of the page and select View Students. 1) If a student has no contacts they will be highlighted red in the list. Alternatively, if a student has no primary contact they will be marked orange. You will need to ensure that students are correctly linked to parental contacts in your MIS. 1) The dropdown menu will be set to Filtered by class (academic classes) by default. To view the list of students for a class, click on the dropdown menu and scroll down to find the class. 2) Alternatively, if you wish to filter by group (Messenger Saved Groups or other non-academic groups), click the Filtered by class You will then be able to use the same dropdown menu to search for a group. 1) To find a student quickly, type in at least the first 3 letters of their surname into the search box at the top of the page, then click Find. 2) To remove the search criteria, click on the Actions menu from the top right corner, then select Reset search. 1) You can re-order the list of students by alphabetical order by clicking on the header at the top of the first column (Student name). 1) Once you have located a student, click on their name from the first column (Student name). 2) From the Student Details page, you will be able to see the student’s primary contact, lunch balance, and the class/groups that they are currently linked to. a. View Activities: view list of activities. b. View Transactions: view payments that have been previously made for activities this student participated in. 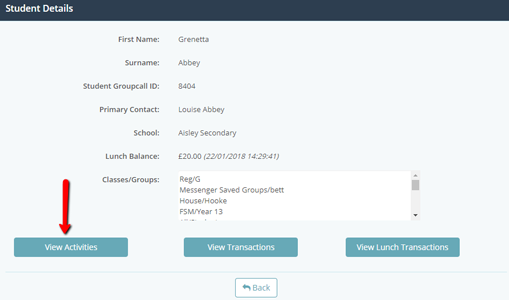 c. View Lunch Transactions: view payments previously made for this student’s cashless catering balance. 1) Click View Activities for the student that you are viewing. 2) The Activity History will display a list of activities assigned to this student. 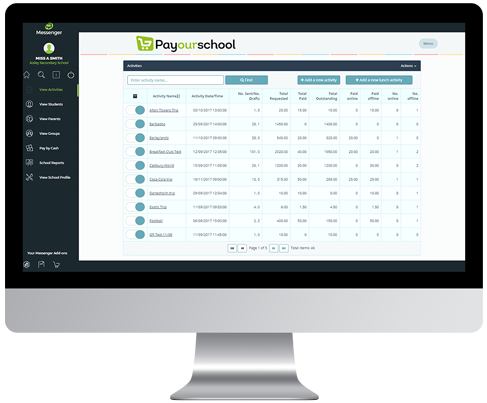 For each activity, you will see the payment required, whether it has been paid or settled, the option to send a reminder and to remove the student from an activity altogether. If an activity has yet to be paid for (identifiable if there is an Outstanding Balance), you can click on the icon under the Reminder column to send an email/SMS to nudge the parent. To write off a payment for a student for any of the listed activities that still have an Outstanding Balance, click the icon under the Settled? column. This will remove the payment required from them. Click on the icon next to an activity/student on the list to add any important notes and to send a reminder home. Click on from the bottom of the page to download a .csv listing the activities assigned to this student. Ensure that you have enabled downloads in your internet browser. 1) Click View Transactions from the View Details page of the selected student. 2) The Transaction History page will display a list of all payments made for this student. 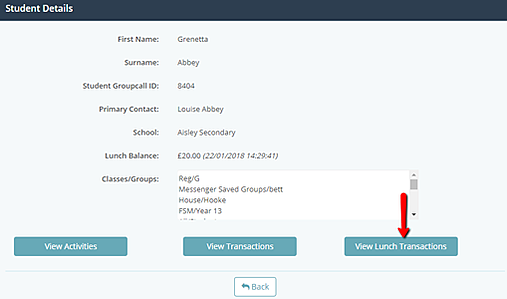 1) Click View Lunch Transactions from the student that you are viewing. 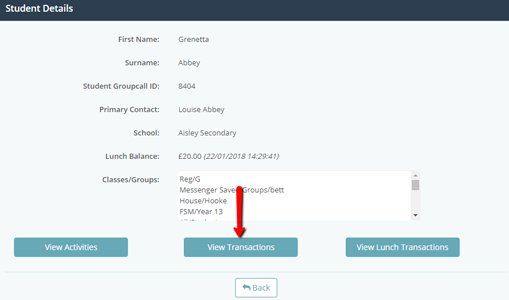 2) Whereas the previous section (View Transactions) will display all payments made for this student’s activities, View Lunch Transactions will just display payments made for lunch activities (cashless catering).